Opossums look like giant rats, with pointed snouts and skinny, hairless tails. 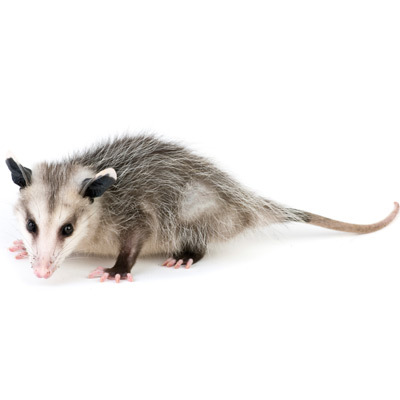 Adult opossums average just 10-14 lbs and do not have a very long lifespan. Rarely do they live more than two years. Opossums are nocturnal and omnivores, so they will eat just about anything. They have the most teeth of any mammal. They are not very fast, and will try stand their ground when threatened. In some circumstances, they will sometimes fake a death, or “play possum”.